I'm so happy today to be opening up a blaster of Be a Player. There was a time on Retail Review when these were regular openings, but the supply of these blasters has dried up. I recently found some in stock, but at a higher price than what I had gotten them before. I couldn't help myself and ended up just going for one! So this blaster was about twice what it was when I used to get them. Back then they were about ten bucks a pop. Now, they are back to their original selling price of twenty dollars. The awesome thing about these blasters is that there is a guaranteed autograph in them. For better or for worse, the autograph set is enormous so hitting a star player can be pretty difficult - but there is a chance of that. There's also the possibility of getting some rare insert cards as well. I've got to say that this blaster was really, really good. These Be a Player blasters guarantee you one autograph, but I was able to pull three! Now that is pretty awesome. The rest of the cards in the blaster were pretty good as well. 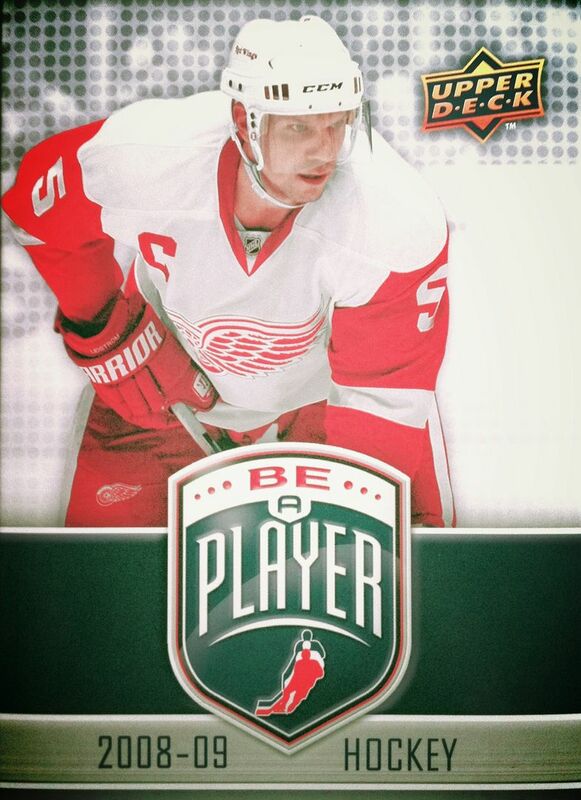 I pulled a few stars in the two packs such as Pavel Datsyuk and Patrick Kane - a great blaster. 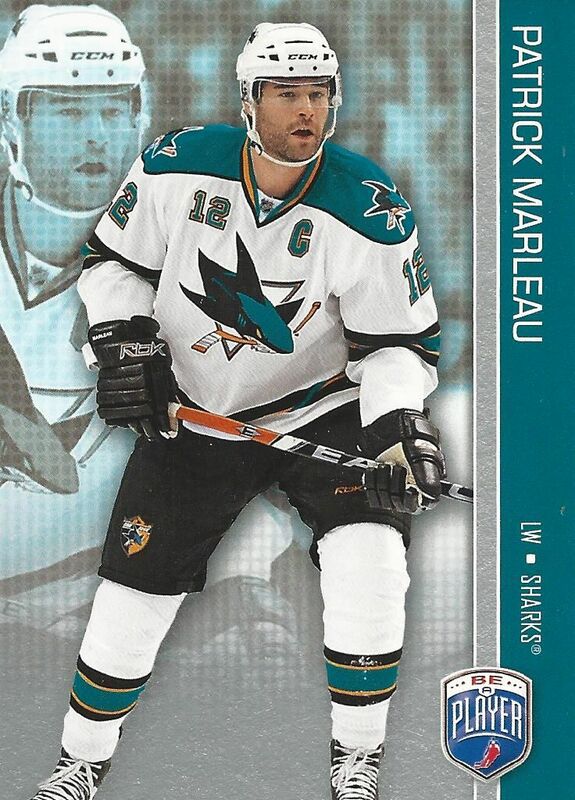 You knew I had to put Marleau here. I love pulling Sharks, and though there may have been bigger names in the blaster, Marleau is still one of the greats and will also have a spot in my top players. I got The Mule! As a Sharks fan, I wasn't too happy to see Franzen on the ice, but I do have a begrudging respect for him and those old Red Wing teams. 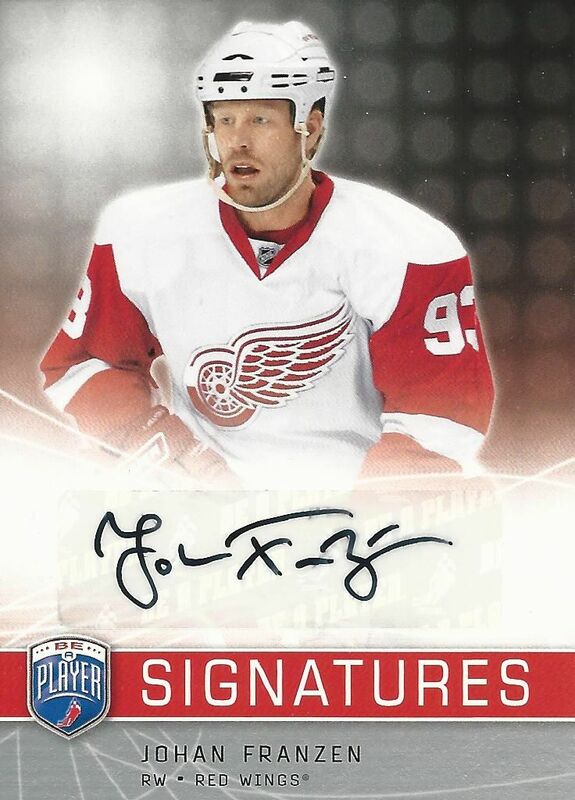 I think this is my first autograph of Franzen's. It looks pretty cool! This dual autograph was completely a surprise! A great surprise! It really pushed this blaster box over the top. 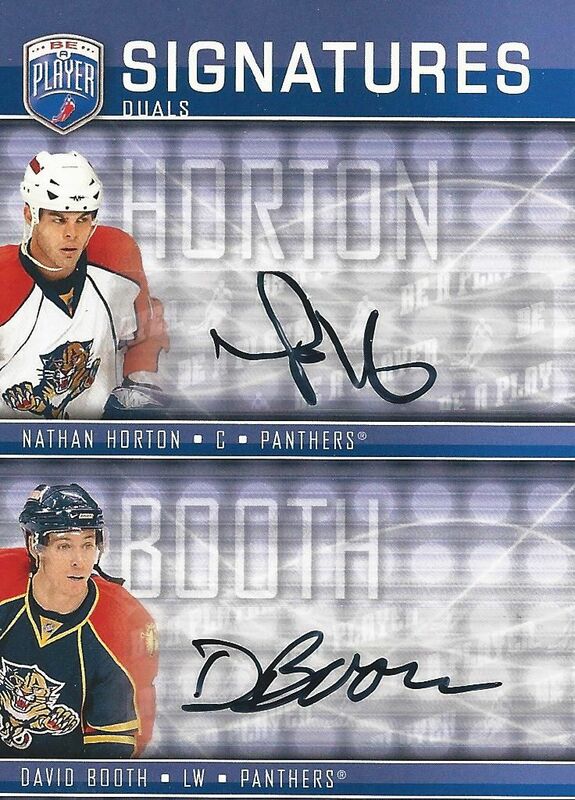 They may not be the biggest names out there, but Horton and Booth have been decent NHL players for their careers. Loved this pull! This blaster was really good. Though the blaster cost me more than I used to purchase them for, what came out of this blaster made up for it. It was very exciting to get a total of three autographs in this blaster. These kind of pulls make me want to get more of these in the future. We'll see if that happens though, it realistically won't be for a while until get another one of the BAP blasters - if at all! Looks good. Not like really good or something, but it isn't bad, you know. What do you want for it? I was waiting for this game for the whole season. And hopefully it will take place soon. I can't miss it and need to buy tickets for my girlfriend and friends. In the rating of scribendi it is the most long-awaited game of this season.